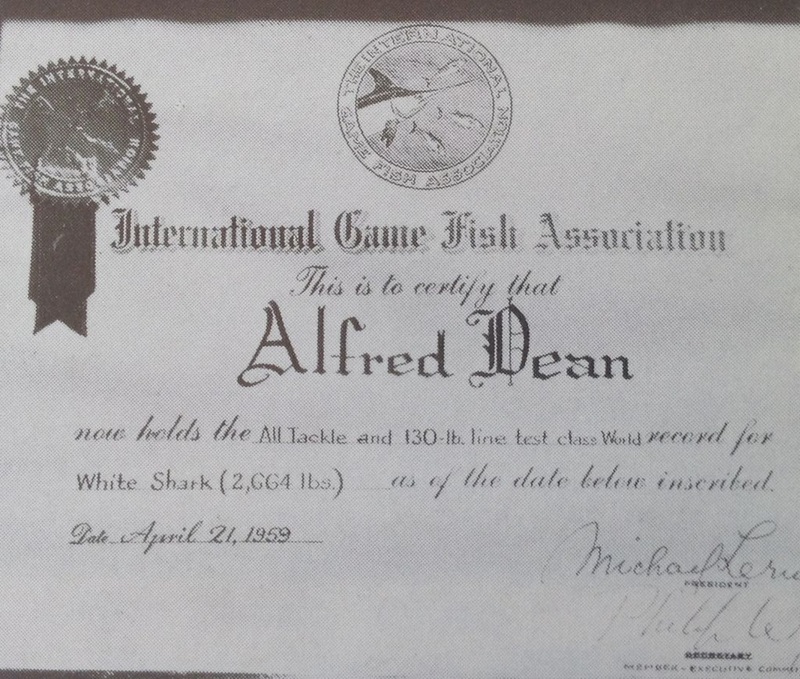 Alf Dean, the shark hunter, was born on 3 July, 1904, at Irymple in Victoria. Alf's father was born at Bright, in north-east Victoria and one of his brothers, Jack Dean, our grandfather, was born nearby at Ovens. This is where their father spent his early married life working around the Ovens Valley. The family, of seven boys and one girl, then made their way to the Darling and Murray Rivers area in NSW. Alf and his brothers would go on their various ways and take on any job they could find locally. Alf's father later bought an acreage block at Irymple, married and developed a successful citrus and grape business. 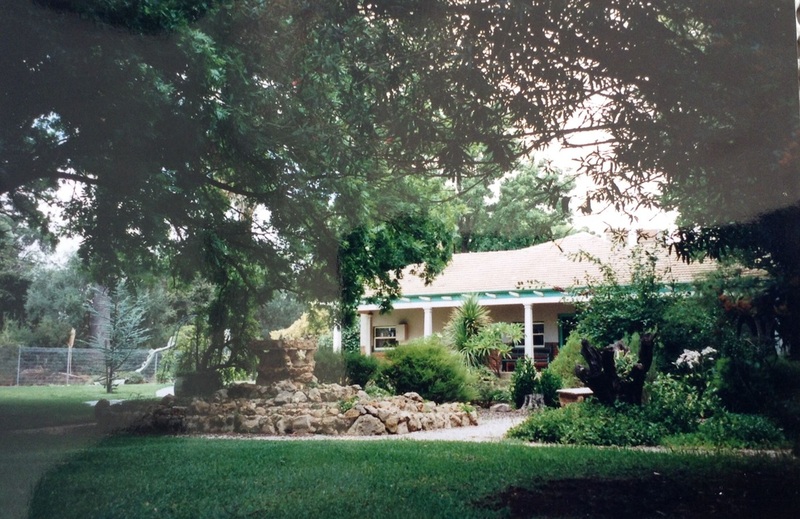 This little irrigation settlement was 8 kilometres from Mildura and its lifeblood, the Murray River, helped shape young Alf's life as a unique and world renowned fisherman. One of the days, in the many trips to the Great Southern Ocean off South Australia, was not without drama when he hooked his first big one. It broke his rod and the line had to be cut to save as much line as possible. His mate then lashed a broomstick to the fractured rod and Alf baited up again. It wasn't long before he hooked another big one. This time the shark was brought in, gaffed and towed to weigh-in at Port Lincoln. 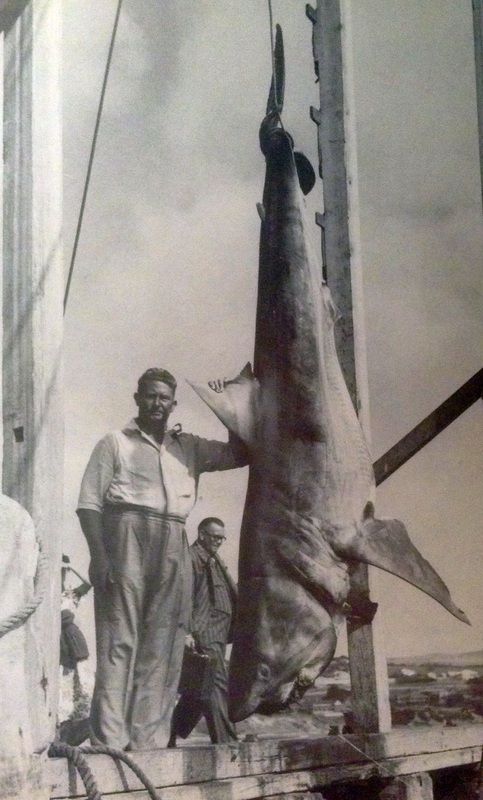 His first shark was a white pointer and a mere 868 pounds. The joke around was 'not bad Alf, for landing him with a broomstick'. After that experience, Alf was hugely keen to get back fishing for the big one but he knew his gear was not up to standard. After researching heavy duty rods and gear throughout Australia, he finally went to southern Victoria and found an 'orange wood' (not the citrus) that he bought at Baccus Marsh and milled into billets in Oakleigh. He then had a Frankston long bow maker make the billets into superb looking rod shafts. He fitted his own ferrules and clips, by binding them on the rod guides. When the rods were finished, he looked at them and said, "these are real beauties" and he felt that he had the best big-game fishing equipment in the world. Meanwhile, many big-game fishermen, including the Governor of South Australia were being featured in the newspapers and at the ports when the fishing boats arrived back with huge sharks close to a ton. As this was happening, Alf in his normal quiet way, was preparing his tact and fishing under the microscope. He was planning his strategy to hopefully catch more and bigger ones than his colleagues. Alf knew that he had now developed the skills to challenge sharks of any size. His equipment was good. He was strong and in good health. All he needed was a fitting adversary. To find the adversary, Alf had his sights set on Streaky Bay. His friend of many years, told him of a sighting of "Barnacle Bill" in Streaky Bay and that he was the biggest shark ever seen. Port Lincoln was considered by Alf to not have the potential for the big one. He now thought Streaky Bay may have, so he sailed off there in 1952, for the big catch. After a rough night with a huge shark bumping the boat from swirling through the whale oil burley, Alf couldn't get his line in quicker, as soon as it hit light the next morning. They could see the sharks circling and then bang the big one took the bait and run. Alf patiently played him on his 120 pound line for 3/4 hour, gaffed and tied him to the boat then set off for Streaky Bay township. The Game Fishing Club chief weighing master hollered out the weight to the big crowd that had gathered. "The actual net weight, which is less the weighing tackle, is 2352 pounds, a world record!" Alf could not believe his ears. It was more than a world record. It was the biggest shark ever caught with a rod and line anywhere in the world and the first shark ever caught to exceed 1 ton in weight. The West Coast Sentinel, out of Ceduna, SA, devoted huge space to the story and proclaimed "It was the most exciting Sunday morning in the town's history. The Dean's have charmed everyone with their unassuming manner and they have been given the keys to the town. They have already put Streaky Bay on the map of the world and we can expect an influx of big game fishermen from every corner of the globe." It had a lengthy nap. Has put us on the map." Offers came in from magazines for the story and friends and relatives sent goodwill messages. Alf knew nothing of these offerings and well wishes, as he was off back to the fishing grounds in search of "Barnacle Bill." Later on, even Hounsells, of Bridport, England got in the act with an advertisment for their fishing line. They were very proud that a "world record 2352 lb White Pointer shark was landed by Alf Dean on a rod with our 78 lb line". A dream promotion. 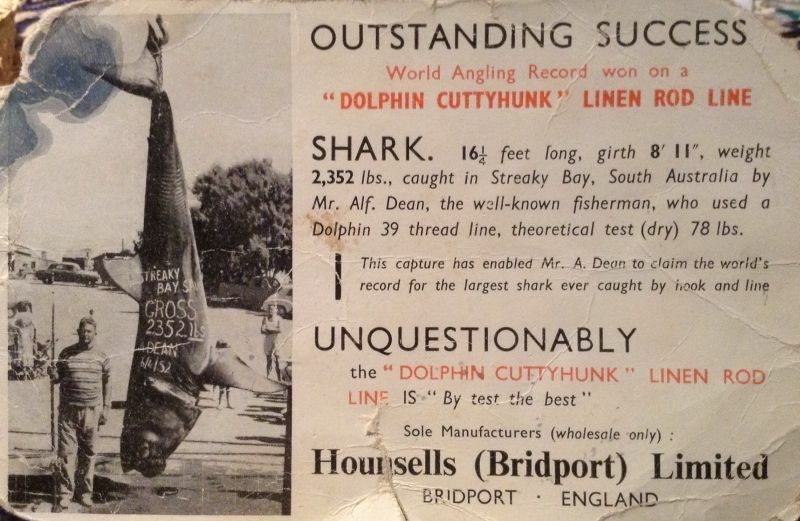 The next one he landed, to break his own world record, was was a 2,372 lbs white pointer off Streaky Bay in 1954. Again the Sentinel editors were estatic. "Noted big game fisherman, Alf Dean has done it again. Another shark over a ton. He has put Streaky Bay on the map by landing a 2,372 lb white pointer and it is the biggest shark ever caught on rod and reel anywhere in the world". Astonishingly though, he had brought in well over 100 white pointers with a combined total of 50 ton. All had been taken between the waters of Kangaroo Island and the Great Australian Bight. All had been taken by a man who was a simple fruit grower on the river Murray and whose fishing was nothing but a hobby, a recreation. He was a Dean and in Alf, we are so proud. They had baited him carefully, to the extent that they would let him swallow half the boat if he wanted to. Alf had then made sure that he had secured a good strike on him. After an hour of playing him deep and a few scary surfaces, the shark had given in to Alf's patience and skill. Within 70 minutes they had him secured alongside the boat. "Alf, that's a big shark, by George", one of the crew exclaimed. They towed it to Denial Bay to be officially weighed in. The Harbour Master declared the weight at ﻿2,664 lbs, a new world record. ﻿To this day, no record has come within 750 pounds of that shark. 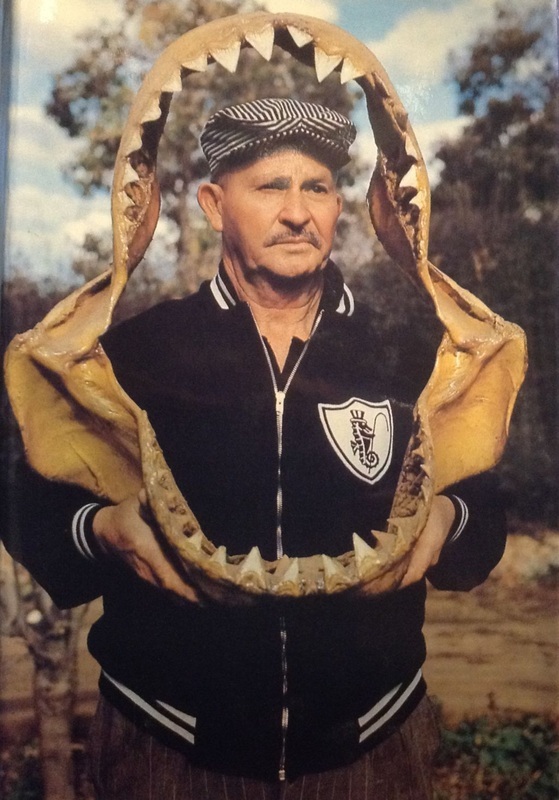 Alf's autobiography, Maneater Man, pictured above, has many great stories and information on his techniques and catches. Although Alf was internationally recognised for his game fishing records and achievements and the many honours bestowed on him, he always had time for his family and friends. Here he is seen with his lovely wife Hilda, reuniting with his cousin Hazel at their home in Adelaide in 1988.